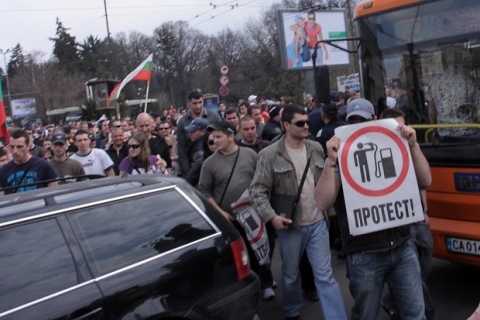 The protesters against the skyrocketing fuel prices in Bulgaria demanded up to BGN 2 for petrol and BGN 1 for propane-butane at the second nationwide protest rally. The demonstrators have gathered by 1 pm on Sunday when drivers blocked with their automobiles major intersections in cities across Bulgaria for about an hour. "It is not clear how fuel prices are formed o the basis of the average wage in Bulgaria. Even the PR Boyko Borisov does not dare to turn against the monopolists," one of the protesters told the Bulgarian Darik Radio, adding that people are protesting because the state does nothing on the matter. The demonstrators insist that all political parties in the country take urgent measures to immediately tame the prices and bring them down to "reasonable" levels by reducing the profits of the Lukoil Bulgaria company, owner of the only oil refinery in the Black Sea city of Burgas. On Sunday, rallies were held in the capital Sofia, Burgas, the other Black Sea city of Varna, and the second largest city of Plovdiv, among others. In Sofia, the protest began more quietly than the first rally. At least 1000 drivers left from four points, with most cars being gathered at the Tsarigradsko Shose Blvd. Citizens without cars have also gathered at the Eagles' Bridge to symbolically support drivers. About 700-800 automobiles gathered at the main protest points in Plovdiv. They entered the city from four sides. One of the demonstrators was giving away daffodils as a protest against the ruling people's turning into daffodils when they hold the highest positions in the government. The protest in Varna started with about 1000 cars with blown horns. There were also about 30 motorcyclists. All of the demonstrators left the city towards the summer Black Sea resort Golden Sands. About 100 automobiles gathered in the city of Blagoevgrad. The protesters are planning to make a tour of the city's main boulevards and then return to the Southwestern University, where they will continue with their rally. Another plan of theirs is to go on the main E-79 road towards Greece and drive with a low speed. Many people also participated in the protests in the cities of Burgas, Veliko Tarnovo, Pernik, Kyustendil, Pazardzhik, Vratsa, Gabrovo, Stara Zagora, Shumen, Sliven, Haskovo and Dobrich, among otherss. Two week ago, citizens, organized by internet social networks, staged mass rallies and blockades. Lukoil and the cabinet signed last week an agreement to freeze retail prices of gasoline and diesel for a month, but the company still upped wholesale prices while some gas stations, not owned by Lukoil, are not adhering to the agreement.